This lease amendment grants the commercial landlord warrants to purchase the tenant’s corporate shares as additional rent under the lease payable to the landlord. In the case of certain start up tenants without a substantial operating history, this is the sort of concession the tenant must offer in order to lease first class office space. The warrant agreement is attached as an exhibit to the amendment. THIS FIRST AMENDMENT TO OFFICE LEASE AGREEMENT (this "First Amendment") is entered into as of the _______ day of _______, by and between COMMERCIAL PROPERTY LANDLORD, L.P., a Delaware limited partnership ("Landlord"), and AGREEABLE TENANT, INC., a Delaware corporation ("Tenant"). 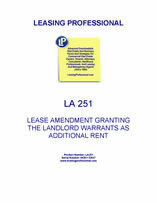 C. Landlord and Tenant desire to amend and modify the Lease in certain respects as provided herein. Unless otherwise expressly provided in this Lease, capitalized terms used in this Lease shall have the same meanings as in the Lease. 1. Issue of Warrants as Additional Rent. As additional rent for entering into this Lease, within ten (10) days of the date of this First Lease, Tenant shall deliver to Landlord a warrant agreement in the form of Exhibit "A" attached hereto. THIS WARRANT AND THE SECURITIES REPRESENTED HEREBY HAVE NOT BEEN REGISTERED UNDER THE SECURITIES ACT OF 1933, AS AMENDED (THE "ACT"), AND MAY NOT BE SOLD, ASSIGNED OR TRANSFERRED WITHOUT AN EFFECTIVE REGISTRATION STATEMENT FOR SUCH SECURITIES UNDER THE ACT, UNLESS THE COMPANY HAS RECEIVED THE WRITTEN OPINION OF COUNSEL SATISFACTORY TO THE COMPANY TO THE EFFECT THAT SUCH SALE, ASSIGNMENT OR TRANSFER DOES NOT INVOLVE A TRANSACTION REQUIRING REGISTRATION OF SUCH SECURITIES UNDER THE ACT. This Warrant has been issued in accordance with that certain First Amendment to Office Lease Agreement dated as of __________ (the "Lease Amendment") between Commercial Property Landlord, L.P. and Agreeable Tenant. THIS CERTIFIES that, for value received, Commercial Property Landlord, L.P., a Delaware limited partnership (the "HOLDER"), is entitled, upon the terms and subject to the conditions hereinafter set forth, to subscribe for and purchase from COMMERCIAL TENANT, a Delaware corporation (the "COMPANY"), at the Exercise Price per share determined as provided herein, up to _________ fully paid and nonassessable shares of the Company's $0.01 par value common stock ("COMMON STOCK") (each a "WARRANT SHARE" and collectively, the "Warrant Shares"). "BUSINESS DAY" means any day that is not (i) a Saturday or Sunday or (ii) a day on which banks are required or permitted to be closed in the State of ________. "CURRENT MARKET PRICE" For the purposes hereof, the "CURRENT MARKET PRICE" of one share of Common Stock on any date shall be deemed to be the closing price quoted in the Over-The-Counter Market Summary or the closing price quoted on any exchange on which the Common Stock is listed, whichever is applicable, as published in the Eastern Edition of The Wall Street Journal for the ten trading days immediately prior to the date of determination of Current Market Price, or if the Common Stock is not traded Over-The-Counter or on an exchange, or, if no such price is available, the Current Market Price shall be as determined in good faith by the Board of Directors following consultation with an investment banking firm experienced in valuations of companies similar to the Company (except that no such consultation shall be required with respect to the valuation of fractional shares pursuant to Section 5 hereof). 2. EXERCISE PERIOD. The purchase rights represented by this Warrant are exercisable by the Holder, in whole or in part, at any time from time to time during the Exercise Period, which shall commence on _________ (the "Issue Date") and shall end at 5:00 p.m. __________ time on _____. 3. EXERCISE PRICE. The price per Warrant Share at which this Warrant may be exercised (the "Exercise Price") shall be $___, subject to adjustment as provided herein.